For many people, Will Smith and Kevin Kline’s 1999 movie “Wild Wild West” was their first mainstream introduction to the genre of steampunk. Wild West (or sometimes “Weird” West) steampunk has all the normal steampunk elements (maybe a little less Earl Grey Tea and English accents) but with a unique spin on it that is very authentic for American steampunks. Being set in the alternate history of the 1890’s of the American frontier, Wild West steampunk makes room for some variation in characters and costumes you wouldn’t find across the pond in Jules Verne’s England. Many people choose Wild West steampunk for their basic persona as the clothing has a lot of overlap with basic, gritty, adventuring steampunk clothes. If you want to meet up with some other western steampunks check out this years’ Wild Wild West Steampunk Convention next month held at historic Old Tucson in Arizona. And check out these ideas below for adding a little more wild west to your steampunk. The American West has a brutal climate. Many clothing choices were made with that climate in mind, and a wild west steampunk outfit should be as well. A hat is valuable protection from the sun. For an adventure across the scorching desert you may want to ditch the top hat in favor of a more utilitarian option. There’s a wide brimmed wool hat called a chambergo worn by Argentine gauchos that would work well. Or you could go with the “Boss of the Plains” the forerunner of the “cowboy” hat. A sombrero could even be an appropriate accessory—if you give it a good backstory. Women might prefer a parasol of some sort for sun protection. Also a Kepi (think civil war cap) is a more diminutive hat that could add a lot of personality to a western outfit. You might also consider a folding hand fan. This useful item could be stowed discretely, but provide a bit of relief from the heat when needed. The blowing dust is always a concern in the desert. Goggles will protect your eyes whether you are riding on your horse or have a more anachronistic mode of travel in mind. Leather goggles make the most sense as the cattle ranchers provided a steady supply. You could wear a more feminine pair like these cameo goggles with beautiful look of expertly tooled leather. Or this pair of Sherlock Holmes Goggles has a rugged natural suede look with eye loupe and targeting eyepiece that makes them ready for adventure. 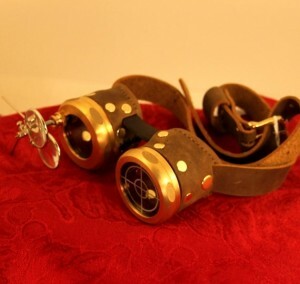 These leather steampunk goggles with eye loupe definitely have a western feel! An accessory called a “wild rag” is also a great protection against blowing sand and dust. It’s like a bandana worn around the neck, but much larger and wrapped twice. The Western frontier continued the American tradition of being a melting pot of cultures. There were the native cultures of Native American groups and Mexicans. Then there were frontiersmen moving West who could be homesteading, cattle ranching, searching for gold, or even just “support staff” like general store or saloon owners that were catering to the other people there. There was also a definite Asian presence as young men from China and elsewhere came to work on the railroad, and other jobs. This created a booming trade market where many cultures were represented. Consider accessories for you Wild West Steampunk outfits from that wide cultural pool. Wearing a poncho would be a great way to hide some really great western steampunk accessories (Like the DIY favorite: NERF Maverick). Glass and bone beads and feathers, were also common trinkets that you could receive in trade from some of the native peoples. You could even wear a bolo tie. Silk was a favorite item from the Orient you might want to incorporate. You could wear a silk wild rag, or a silk shawl. Or even a nice detail, like lining your leather vest with a patterned silk. Men’s shirts at the time came in one arm length—extra long. Everyone else had to use arm garters to get the right fit. If you are a business man, or anyone wearing a nicer shirt, you should consider arm garters to complete your look. Spurs would make a nice addition to a wild west steampunk outfit, along with any kind of leather saddle bag or satchel—perhaps even with a tin cup or mess kit hanging off the side. 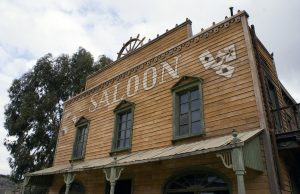 Look around for more ideas for wild west steampunk, by watching some old western shows, or scanning the internet. There’s a lot of potential to put together an outfit that’s really going to stand out if you make sure to remember the contexts of the unique desert climate and varied culture.